Diagnosis is hard. Especially when it comes to joint injuries. Doctors can make educated guesses based on your symptoms, to be really sure, they’ve got to look inside. While MRI is the most popular option, it’s expensive, time-consuming, and not particularly accurate. That’s why this new, miniaturized camera that can be stuck inside your joint is such a big deal. And I should know. I just experienced it. Any orthoscopic surgeon will tell you that the gold standard for diagnosis is arthoscopy. When you go in to have knee surgery, they typically make three holes in your knee. Two for the little arms that’ll cut and move and fiddle with your bits, and one for a camera. Each of these holes is on the big side (generally around 8mm or 0.31 inches), which requires stitches and some time to heal. They also pump a ton of fluid into your joint, which greatly increases the swelling and healing time. What’s crazy is that when they finally get in there’s a high-percentage chance they don’t see what the MRI indicated they would see. Something isn’t torn that looked like it was, or something else is a problem that didn’t show up at all. Seeing it in real life, through a camera is typically 50 percent more accurate for diagnosis. But of course, you can’t just schedule a surgery for the purposes of diagnosis. The incision for the camera alone would require weeks of healing, not to mention you’d have to book some time for the very busy and very expensive operating room. VisionScope Imaging is essentially that arthoscopic camera, miniaturized. The hole they make in your skin is only 1.8mm thick, and that’s significant. For whatever reason, 2mm is the magic number when it comes to healing. Anything over 2mm requires stitches and some real recovery time. Under 2mm, though, and the tissue typically compresses itself back together, and you can just throw a Band-Aid on it and you’ll probably forget it was ever there within a few hours. In fact, not only is the camera and the wound miniaturized, but the entire system is, too. Rather than requiring a setup that looks like a small refrigerator, VSI is driven by a computer that looks, well, like a computer. Its brains look like a desktop tower lying on its side, and it fits easily on a little cart that can be wheeled around from room to room. All this combined means that VSI can be done right in the doctor’s office, on the same day as your first appointment. If you’ve been through the rigmarole of orthopedists and imaging specialists you might shed a tear of joy right now. Usually, you have to go see the ortho, and she or he will tell you to go get an MRI. Then you have to make an appointment and do that (which, even with decent health insurance isn’t cheap). Then you have to wait until they send the results to your ortho, and then you have to go back to your ortho for him to interpret the results and give her or his recommendations. And there’s a still high rate of misdiagnosis! With VSI, your ortho can look into your joint right then and there, see what’s really going on, and make a recommendation immediately, based on information 50 percent more reliable than MRI. Not only that, when it’s done you can just get up and walk away. I generally avoid the phrase “game-changer” like it was the plague… but it’s kind of a game-changer. The working end of the VSI is a long, thin needle attached to a small handle with some buttons on it. It looks a bit like the thing a dentist uses to squirt water onto your teeth. Or maybe like a skinny meat thermometer. The buttons on the handle do things like trigger the shutter to take stills, or record video. Despite the thin tube it’s able to shoot 1080p video, which is really impressive. It also supplies its own light source. One of the reasons VSI is easy to use in an office setting is that the working end of the device never actually has any contact with your anatomy, which would require expensive (and time consuming) sterilization. What actually goes into your knee (or other joint) is a sort of sleeve. 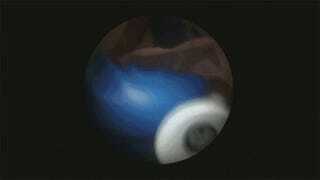 The doctor pokes it through your skin, and once it’s in, they just put the camera into it. No goopy body fluids to clean off the things that get reused. One of the other major advantages VSI has over MRI is that the doctor can move your limb around. In an MRI you have to lie very still for a very long time. With VSI, if the doctor can’t see a part of the knee that she wants to see, then she can just bend your leg to expose the area that needs to be checked out. You’re also fully awake for the whole thing. They just numb you locally with a lidocaine shot, and you’re ready to go. While I keep talking about the knee, because that’s what I had done, it’s important to note that it’s made to work on virtually any joint in your body: hip, ankle, wrist, and even the ever-tricky shoulder. When it’s all done, they just throw the sleeve away and the machine is ready for another patient. They throw an adhesive bandage on you, and they have you walk around to make sure you’re fine, and you’re out the door. They just tell you not to run on it for a day or two. Not bad. I find myself in a doctor’s office at the Boston Sports Medicine and Research Institute in Massachusetts, wearing shorts seemingly made of tissue paper, wondering what the hell I was doing there. I have a bit of “a knee thing,” you see. As in, I don’t like it when people even touch my kneecaps because they seem so delicate, so the idea of needles and probes going in there frankly scared the hell out of me, and I wondered if I was making a huge mistake. I’d received a pitch for VSI at my Gizmodo email address, and it sounded interesting. And opportune. I had recently screwed up my knee. How doesn’t matter, but suffice to say that it was stupid. Okay fine, I blew it out at a trampoline gym. There, are you happy? Sheesh. Anyway, it was popping and clicking when I walked down hill or went down stairs, which made me nervous. I’d had an MRI and doctors and checked it out and prescribed PT, but it wasn’t improving. So the VSI email came at the perfect moment. I needed to know what the hell was going on in there. I basically said, well if you’re so confident and you want me to write about it, how’s about you do it on me? I expected them to balk and disappear. Instead they jumped at it. They said if I could get to Boston they could have VSI’s inventor, Dr. Thomas Gill ,do the procedure himself. A quick Google search showed me that he came through Havard’s med school, has been at Mass General for 16 years, and has served as the medical director and team doctor for the Boston Red Sox, the New England Patriots, and the Boston Bruins. If I was going to trust anybody to tinker around inside my knee I couldn’t really have dreamed up a more reassuring résumé. So, the doc comes into the room. He gets my medical history and the story behind my knee. He checks out the CD I brought that had my MRI on it. He pokes my knee to see where it hurts. He gives me a run down of what’s going to happen and then we’re off to the races. Dr. Gill swabs down my knee with some iodine to clean off the area, then he takes a rather large syringe full of lidocaine, and injects it just under my knee cap. He moves the needle around in there to get it all over the inside of my knee, using what seemed like a crazy amount of fluid, but I definitely didn’t want to feel anything so I wasn’t about to argue. When he was done, a giant bubble had formed under my skin from all the extra fluid. He said to give it five minutes, which would allow it to distribute more evenly and to take effect. Indeed, a short while later I had one very numb knee. He then pats a sterile drape onto my leg, and then he unwraps the sheath for the device which is about to be inserted into my knee. It looks the biggest needle I’ve ever seen. I focus on breathing deeply. Dr. Gill says that I’m going to feel a couple pops. Sure enough, a little pressure, and pop! And then a little more pressure and second one. Dr. Gill informs me that that was the needle piercing through different layers of skin and tissue. Charming. More deep breathing. I feel a bit of pressure, but no real pain. He grabs the working end of the device and then inserts it into the sheath, and then holy crap, that’s the inside of my knee! He started angling the camera around. It was mostly clear in there with just a few flecks of flotsam and jetsam and a tiny plume of blood, probably from where the needle pierced the skin. It was incredibly surreal. There was a little syringe attached to the side of the scope that was filled with a clear saline fluid, which he’d use to push little bits of stuff out of the way for a clearer view. Dr. Gill played internal tour guide as I watched in amazement. “So here’s your femur, and here’s your tibia. That’s the articular cartilage, and then over here, that’s your meniscus cartilage, and that looks pristine.” Instant huge relief. My injury had all the symptoms of a meniscus tear and I was sure that the MRI had missed it. Onward. I was asked to extend my leg a little bit. As I did, I could see my joint open up, and new parts of it were revealed. Almost immediately Dr. Gill saw something. “You see that? It looks like a little pothole on your joint?” I did. He pressed a button on the scope and snapped a couple pictures of it. Osteochondritis dissecans, were the words he said. Basically some erosion to the joint surface, where over time the cartilage had worn away there. “Nothing that would require surgery, I wouldn’t think,” he said. Music to my ears. He pulled the VSI out of my knee, slapped couple butterfly bandages on my knee, and just like that, my Magic School Bus ride was over. He had me get up and walk back and forth down the hall to make sure everything was okay. No problems, just a numb knee. He recommended I gave it 48 hours before I really exercise, but said my snowboarding trip I had planned that weekend should be no problem. And he was right. I spent a full day on some very icy slopes in Vermont and my knee didn’t bother me at all. Amazing. About 20 minutes after I underwent the procedure myself I sat down and talked with Dr. Gill. I’d seen how well it worked with my own knee. I wanted to know more about how it did with other joints. While VSI can be used anywhere you have a joint, hips have got to be one of the areas where there’s the most to be gained. Because the hip is a ball-in-socket joint right now you almost have to dislocate the joint in order to be able to see inside it with a larger, traditional orthoscopic camera. I mean, they need to put you in traction and put weights on you to basically pull it your hip out of the socket so they can see inside. Which sounds absolutely horrible. In contrast, VSI is thin enough that it can be inserted along side the ball, into the socket, and look around. Pending a few potential modifications—like the addition of a 30 or 70 degree prism at the end, which would allow them to see at an angle, like a periscope—VSI should allow doctors to see the whole of the interior joint surface, right in their office, without any traction. It could very well become the scope of choice for hip arthroscopy, and if so, it would likely replace the traditional scopes even in the operating rooms. That would be huge, and it’s already being tried in certain instances. After a meniscus surgery. That is completely insane. The Pats won that game 34 to 31. They’re calling that procedure “VisionScope meniscectomy” (as opposed to arthroscopic meniscectomy) and they’re just starting the case series now, so hopefully we’ll have something more to report soon. So far VisionScope has had a very limited roll-out to just a few practices. They’re still testing, fine-tuning, and improving the software, but it’s already making a lot of waves. A recent prospective randomized clinical study backed up VSI’s claims, that it’s 50 percent more sensitive and accurate than MRI, and that there was no difference in accuracy between the VisionScope and the current gold standard surgical scope. These advances are especially important in this era of medical cost containment. According to Dr. Gill, one of the U.S.’s largest insurance companies did an independent analysis of the cost benefits of VSI and found that VSI has the potential to save between 400 and 600 million dollars a year to the healthcare industry, by displacing not only MRIs, but unnecessary surgeries. Other independent analyses have mirrored these statements. Obviously it’s still early days here, but it seems the VSI has a ton of potential. Speaking personally, from my own experience, every time I have an ache or pain in one of my joints now I start wishing I could head back to that clinic and have it actually looked at. The rollout has been slow and deliberate, but maybe in the future this or something like it will be a common instrument you’ll see in your doctor’s office. The idea of better, faster, less painful diagnoses is one of the holy grails of medicine, and this has me thinking it might not be too far off.